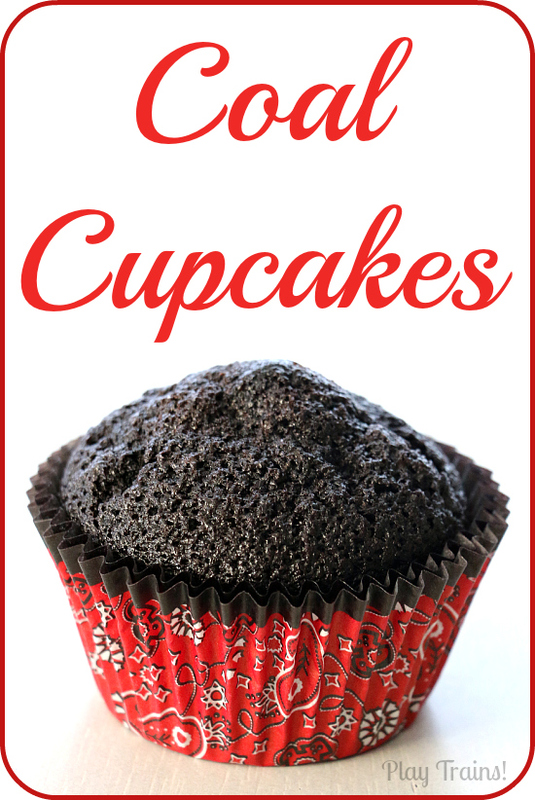 These are the most chocolatey, moist, and delicious cupcakes I’ve ever made or tasted. But what makes them extra fun — whether for a Christmas treat or a train-loving kid’s birthday party — is that thanks to the type of cocoa powder we used, they’re as black as coal! Here’s a story for you if you ever feel like bloggers get things perfect all the time: I was supposed to decorate the tops of these cupcakes for the Little Engineer’s fourth birthday party. After making Thomas cakes for his second and third birthdays, I was pleasantly surprised that he wanted Thomas yet again, despite the fact that he’s just as interested in Angry Birds and Star Wars now. He decided he wanted cupcakes this time around, which was a good thing — I didn’t really want to have to top last year’s 3D Thomas cake! 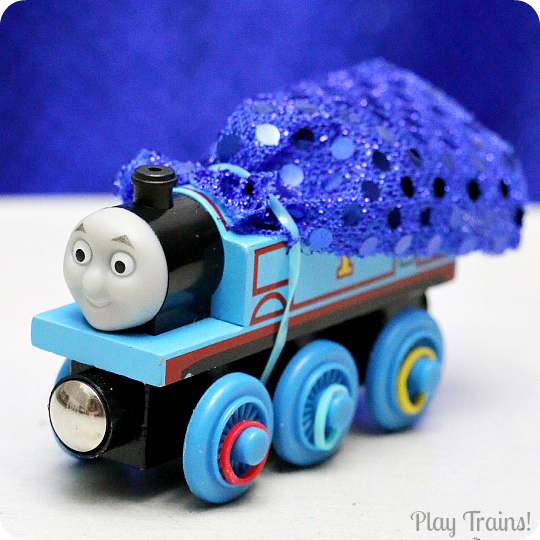 We had a really cool idea for how to make little Thomas engines to go on top of each cupcake, and we were both really excited to see if it worked. But, between trying to finish remodeling our office into an office/train room (we’re still working on that) and trying to clean the house for the party, the best I could do was bake the cupcakes with him the morning of the party. I did try to make some ganache to spread on top, but I got distracted and overheated it. 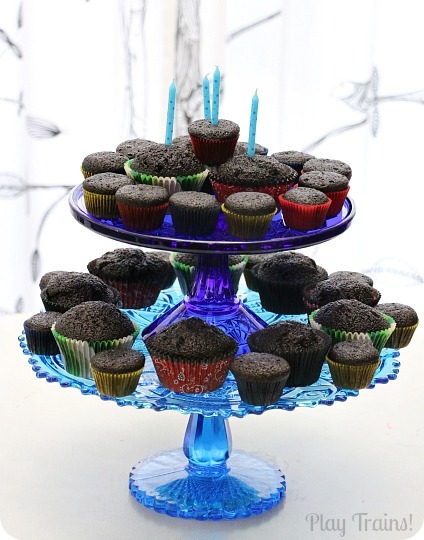 I couldn’t exactly top his birthday cupcakes with an oily, clumpy mess. And here’s the part where I mention that I went to pastry school. I haven’t worked in the industry for years now, but I’ve always said that at least my kid will have cool birthday cakes. You can imagine how disappointed I was. The presents had been opened, and it was time for cake. I decided to try a cupcake, and see if I could serve them without frosting. Delight and relief probably made that first bite taste so heavenly, but there’s no doubt that these are the best cupcakes I’ve ever made or eaten. 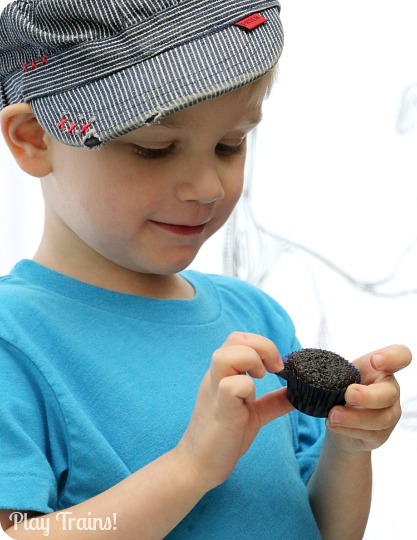 And then it occurred to me that between the color of the cupcakes and their deceptively rough-looking tops, we could call them “coal cupcakes”, and they’d even fit the original train theme! A bit of negotiating with the Little Engineer later (we’re going to be making the fancy cupcakes we planned for a special tea party sometime soon), and I was arranging the cupcakes on a couple of glass cake pedestals. Everyone loved them! No one missed the frosting. But perhaps the biggest compliment of all came from the Little Engineer himself. Not in the form of words, but in the sheer number of cupcakes he ate that afternoon. 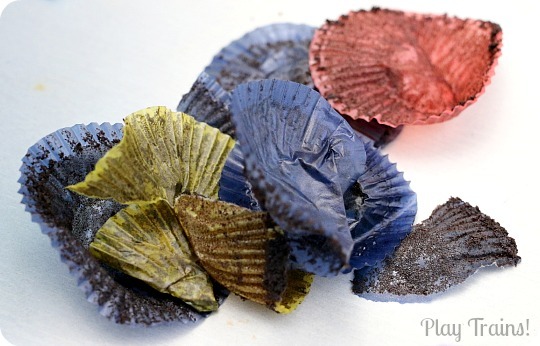 And here’s the evidence: the pile of cupcake wrappers he amassed on the table while he munched and helped put his new Lego sets together. Good thing he was only eating the mini cupcakes! 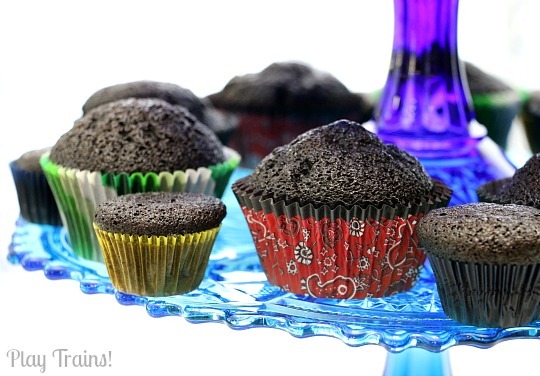 So, what’s the secret to making these chocolate cupcakes as black as coal? The recipe we used was Favorite Fudge Birthday Cupcakes from King Arthur Flour, with one modification: we replaced half of the Dutch-processed cocoa in the recipe with King Arthur Flour’s black cocoa. The recipe was really simple to make, and it’s amazing how black the cocoa really is. Of course, I’m 100% sure they’d still taste as good without it, so if you don’t have black cocoa, don’t worry. 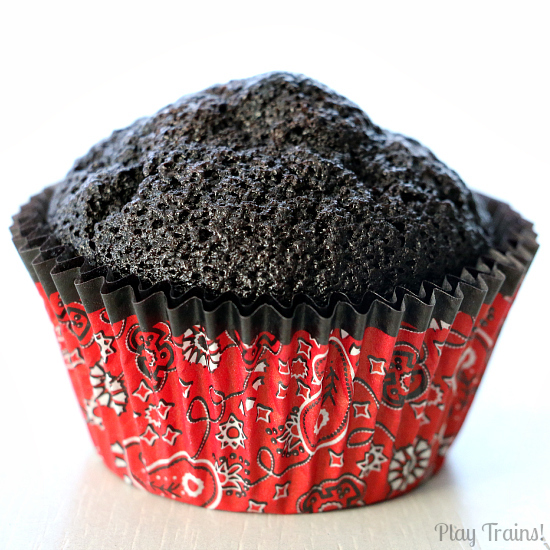 If you’re making these coal cupcakes for a train-lover, the grease-proof bandana cupcake liners we used (we found them at Whole Foods). 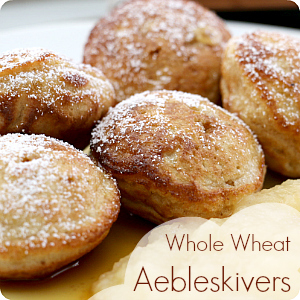 If you love cooking with your little engineer as much as I do with mine, you might want to try another festive favorite, our Whole Wheat Aebleskivers. 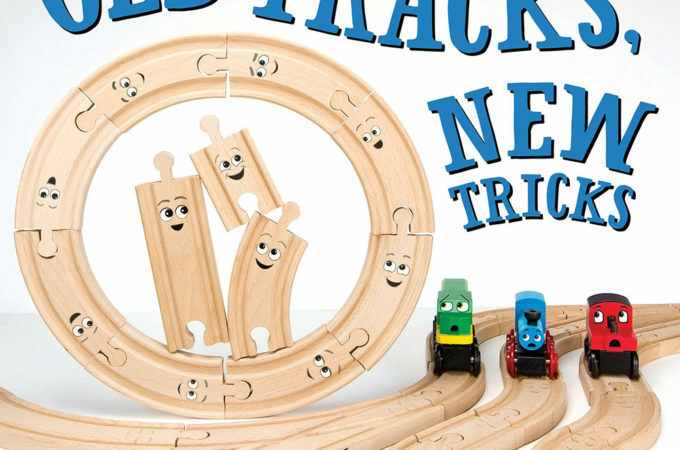 They’re perfect for serving on a toy train!